The new RoboWrap Shuttle adds one more affordable layout concept to the Saimatec Robowrap range of automatic wraplines. This new concept is a variation of the Robowrap Single concept launched in the market in 2009. Robowrap Shuttle provides fullautomatic roll wrapping for capacities up to range of 60 rolls per hour, with an extremely compact and versatile layout. Key element of the concept is the moving wrapping station, a new application of Saimatec’s patented Robowrap Optima technology. Automatic dispensing of inner and outer heads as well as labels and ink-jet marking are performed with robots and manipulators, as is typical in the whole Robowrap product range. 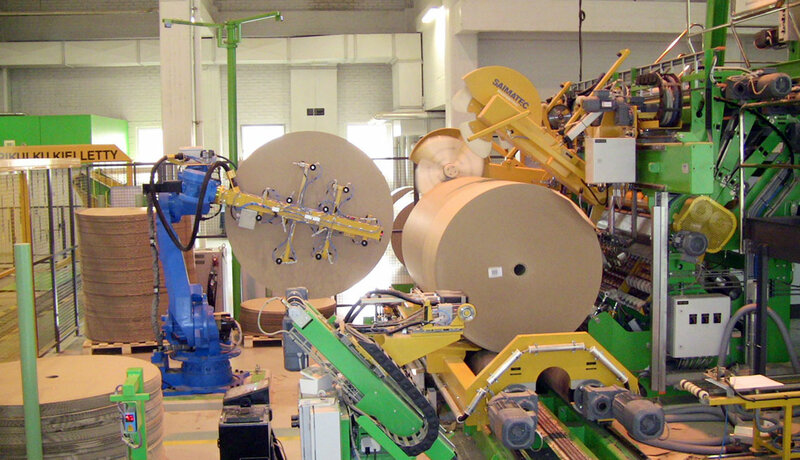 One great benefit of the layout concept is that it may be installed at a very short shutdown beside an existing roll wrapping or roll handling system. The Shuttle technology is also available as a modernisation to an existing system. Robowrap Shuttle will be complemented with our complete range of roll handling products including conveyors, turntables, kickers and receivers, upenders, and much more. First Robowrap Shuttle system will start production in May 2011 at Powerflute Savon Sellu, Finland.